With the same unit, Corporal Williams was a Demolition Sergeant during the Battle for Iwo Jima. On 23 February 1945, when American tanks were held up by Japanese guns, minefields and rough island terrain, he advanced alone and, in a four hour effort while under terrific fire, utilized demolition charges and flame throwers to annihilate many enemy positions, thus enabling his company to reach its objective. For his “conspicuous gallantry and intrepidity at the risk of his life,” he was awarded the Medal of Honor. As the desperate struggle continued, on 6 March he was wounded in action. On 5 October 1945, President Harry S. Truman presented Corporal Williams with the Medal of Honor during ceremonies at the White House. 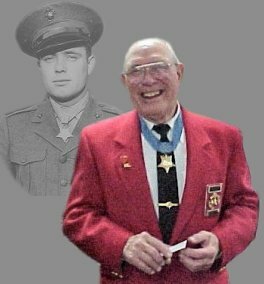 Discharged from the Marine Corps Reserve in November 1945, Williams reenlisted in the inactive Marine Corps Reserve in March 1948, serving until August 1949. He again joined the Marine Corps Reserve in October 1954, serving with units based in West Virginia and attaining the rank of Chief Warrant Officer 4 before retiring in 1969. During the 1960s he was also a civilian counselor to the armed forces, and was awarded the Vietnam Service Medal by the Veterans’ Administration for this work.